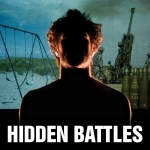 Hidden Battles is an accomplished documentary bringing us 5 war participants-as-fighters and the years that have followed them: Israeli soldier, Palestinian Al Aqsa brigade, Sandinista guerrillero (and a woman), two Americans, one from Vietnam and one, along with his wife, from the Somalia expedition. Their stories are told to the camera, some on the sites of former fields of battle. All are having a tough time of it, some far more than others. Most gripped by what we recognize as PTSD is Aaron, a former Marine, who was deployed to Somalia in 1994 as a scout/sniper. As he says to the camera, “the really cool summer camp he was in, playing soldier, came to a crashing halt.” Confronted with actually pointing his weapon at someone and pulling the trigger, with intent to kill, un-nerved him. While in the field he vowed not to do it. While in the field, he did. His wife with him, he has gone through the hell many of us have heard of — and at movie end, he seems to be getting a grip on it, but it has taken exile into the wilds of Scotland to get the quiet he needs. The pairing of Saar, an Israeli former Special Forces officer, with Zachariah, a Palestinian, is very interesting, though far less clear as to their ‘hidden battles.’ Zachariah, in fact, though he is out of the brigades and no longer a front-line soldier, seems hardly bothered by his experience — except in wishing his own children will not have to repeat it. Saar, now a dance choreographer in New York City, takes us on a tour of his old base. To his own surprise he responds viscerally well to having his old weapons in hand and leading recruits on a firing range training. He is worth a different movie, with others, exploring the continuing tug of war and weapons on many, particularly those who got away with lesser traumas. George, the older American, who fought in Vietnam, is more of the kind of veteran we Americans associate with having PTSD, though long under control. Single and compassionate, he devotes a lot of time to helping his old comrades and newer men from America’s wars to adjust and stabilize after their experiences. A very interesting find for the film makers was Esmerelda, now a house keeper in New York City, who once carried a gun and, as she tells us, fired to kill, in the Sandinista war against Somoza. She goes with the film crew back to Nicaragua and after a bit of a guided tour in her old neighborhood, where she seems well known and warmly greeted, becomes ’emocionada’ and has to leave. Again, it would have been good to have her paired with another, or several others, from the Central American fighting. How closely, if at all, is PTSD linked to a sense of righteousness in fighting? Do those who believe they are fighting for nation and family, on their own soil, come out with less trauma than those sent to do the bidding of a remote and unapproachable government? Mills doesn’t include commentary from mental-health professionals. Only Aaron has been forced into deep self-reflection and repair. The others have careers or work of some sort and however much the past comes back at them, they seem largely functional. The spectrum of PTSD is present for us but not an analysis of it — nor the conditions of war that created it. A good film for those wanting to experience and think about, at a beginning level, the cross cultural impact of war. More films, pushing deeper, would be welcome. For something immediate, a memoir by a female American soldier, titled Plenty of Time When We Get Home, sounds like a heart-felt, experience-full entry into post war trauma. She is making the rounds of book talks and can be found here with Terry Gross of Fresh Air on NPR. Really quite an amazing story which we all hope continues to come out as good as it now seems — rising from the depths of black-rage-with-pointing-guns.